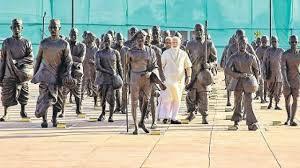 The Prime Minister Recently Inaugurated The Solar-Powered National Salt Satygraha Memorial At Dandi In Navsari District, Gujarat To The Nation On Mahatma Gandhi’s 71st Death Anniversary. Dandi March Or Salt Satygraa Was A Major Non-Violent Protest Action Led By Mahatms Gandhi In March –April 1930. Britain’s Salt Act Of 1882 Prohibited Indians From Collecting Or Selling Salt, A Basic Necessity In Their Diet. The State Monopoly Oversalt Was Deeply Unpopular By Making It His Target,Gandhiji Hoped To Mobilize A Wider Discontent Against British Rule. On March 12, 1930 Gandhiji Set Out From His Ashram, Or Religious Retreat, At Sabarmati Near Ahmadabad With Several Dozen Followers On A Trek Of Some 240 Miles To The Coastal Town Of Dandi On The Arabian Sea. On 6th Of April, Gandhiji Reached Dandi Coast And Broke The Salt Law By Picking Up A Small Lump Of Natural Salt Out Of The Mud. The Violation Of The Law Was Seen As A Symbol Of The Indian People’s Resolve Not To Live Under British-Made Laws And Therefor Under British Rule. Salt Was Chosen To Symbolize The Start Of The Civil-Disobedience Movement Because Salt Was Deemed As Something On Which Each Indian Had The Basic Right. Mahatma Gandhi Declared Resistance To British Salt Policies To Be The Unifying Theme For The Civil Disobedience Movement. Civil Disobedience In Different Forms Continued In Different Provinces. Special Stress Was Laid On The Boycott Of Foreign Good. In Eastern India, Payment Of Chowkidari Tax Was Refused. This No Tax Campaign Became Very Popular In Bihar. In Bengal, J.N. Sengupta Defied Government Laws By Reading Openly The Books Banned By The Government. Defiance Of Forest Laws Assumed A Mass Character In Maharashtra. The Movement Had Taken A Firm Hold In Provinces Of U.P., Odisha.Tamil Nadu, Andhra Pradesh And Assam.